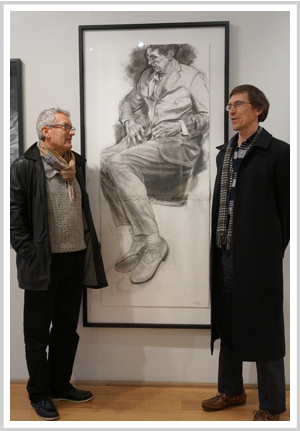 Nice Shoes, my drawing of an old friend David, was selected from 1,973 artists from across Europe and the UK and was hung in the 2016 Columbia Threadneedle Prize: Figurative Art Today. The drawing was inspired by a painting by Philip Hale that hangs in the National Portrait Gallery. David sat for me in my studio in Kingston on Friday afternoons over a 2 month period in the early part of 2015. 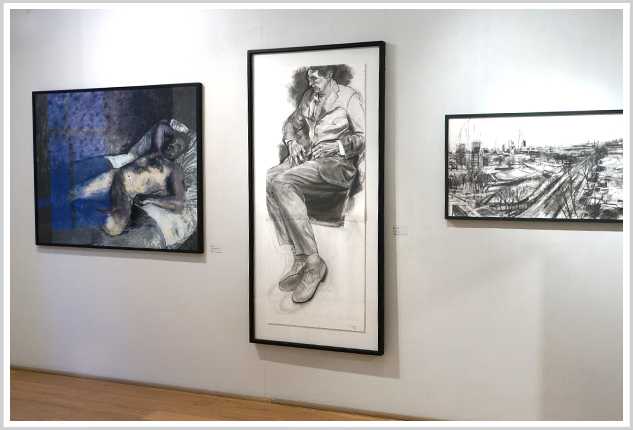 In the picture below right, taken at the exhibition at the Mall Galleries, David is on right and I am on the left of the drawing. Now in its eighth edition, The Columbia Threadneedle Prize is Europe’s leading open competition for figurative and representational art and, at £20,000, one of the most valuable art prizes in the United Kingdom. Visitors to the London exhibition were also to decide the Visitors’ Choice Award, worth an additional £10,000. A selection of the works from the London exhibition have been taken to Italy for a further one-month exhibition at Palazzo Strozzi, Florence in June 2016. The Columbia Threadneedle Prize is supported by Columbia Threadneedle Foundation, the charitable foundation of global investment manager Columbia Threadneedle Investments. Columbia Threadneedle has funded the Prize since its inception, demonstrating the firm’s long-term commitment to supporting the arts.